In our modern society, elevators play an important role in getting the public to their destination on time in a safe and efficient manner. Often, elevators are too reliable, becoming nothing more than a dependable tool until something breaks down. From apartment complexes to highrise structures, it’s important to find a quality elevator manufacturer to ensure that your building’s employees and guests are able to safely move about the property safely and efficiently. Kohtler Elevators is proud to be among the top elevator cab companies in the nation, providing a wide range of parts and services to ensure the highest level of customer satisfaction. We’re passionate about designing the most reliable and luxurious elevator parts in the industry. The world of elevators is full of interesting facts and historical happenings. Today, we’ll discuss a few of these tidbits to equip you with helpful knowledge, whether it’s to comfort nervous elevator riders or to impress friends at a trivia event. If your building is in need of reliable and professional elevator parts, be sure to reach out to the Kohtler team for assistance! At the beginning of the 20th century, people were just beginning to form their opinions about these complex vertical machines. Back in the early days, elevators were slow. Riders of the late 1800s and early 1900s rode in elevator cabs that looked quite different from today’s styles. These cabs were full rooms, featuring comfortable aspects such as furniture and carpeting to allow occupants to truly get comfortable for the ride. Many cabs featured luxurious fixtures such as chandeliers, creating a sense of comfort in the newfound machines. Our early elevators featured comfort and professionalism, and they were a far cry from devices used during the rule of the Roman Empire during the first century of our modern era. These ancient elevators were used in conjunction with trap doors to help transport all manners of equipment and animals to the surface for fighting, whether it was a group of armed slaves or a dangerous beast. In total, 24 elevators were used, requiring the hard labor of roughly 200 servants to complete the raising and lowering procedures. The Roaring Twenties saw the widespread use of elevators, as these handy machines became more and more common across the country. The phobias surrounding elevators today are far less widespread compared to the early 1900s, as citizens and doctors alike worried over the negative health effects. “Elevator sickness” was one concern for doctors, which is a medical issue that is caused by the sudden stopping of an elevator and results in damage to the body’s internal organs. The quick changes in elevation also caused concern, as the rapid changes in height were open to mass speculation on how the body reacts. Placing yourself in a big metal box that moved vertically through a building back then was a nerve-wracking experience, which is why measures such as elevator music were put into place to ease the stress. That soothing melody is in place to keep you calm and cool during your short trip in the elevator cab. The slow speeds and high levels of anxiety also gave rise to the implementation of mirrors. Installing mirrors in an elevator helped to make the ride feel faster. These reflective surfaces also open the space up and make it feel more airy, helping people who struggle with claustrophobia. As humans, we are fascinated by the morbidity and danger that surrounds us. One common fallacy we hear in this industry is the high level of danger associated with elevator systems. One interesting statistic that we’re happy to share with you is the fact that elevators are twenty times safer than escalators. Annually, about 27 people are killed in elevator-related accidents. While this may seem like an alarming number, it’s important to note that elevators in our country account for roughly 18 billion uses per year. According to the math utilized by the U.S. Bureau of Labor Statistics and the Consumer Product Safety Commision, that equates to a fatality rate of 0.00000015% per trip. Oftentimes, the fatal incidents that occur either result from repair technicians working in hazardous situations or citizens failing to follow proper protocols. Contrary to the popular belief instilled by mainstream media, elevators are built to be excessively safe. In fact, most elevator systems utilize between four and eight cables to ensure safe passage, even in the event that multiple cables snap or fail. Elevator shafts are also equipped with automatic braking systems which deploy when a failure is detected. If these brakes fail, a set of electromagnetic brakes are in place to automatically stop a cap from falling. If nothing fails to work properly, a large shock absorption device is placed at the bottom of the elevator shaft. Historically speaking, only one occurrence in history has been documented of a car falling to the bottom of an elevator shaft due to a broken cable. This event happened at the Empire State Building in 1945, when a military plane crashed into the structure, causing the cable to snap on a car that was resting at the 75th floor. One woman fell inside this car, plummeting over 800 feet to the bottom of the shaft. The cab, however, landed on a huge pile of the failed cable, softening the impact and allowing the woman to survive. 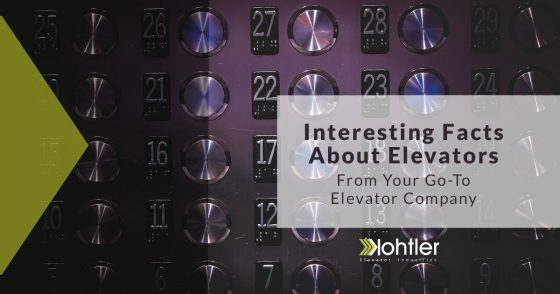 When it comes to the world of elevators, people are often surprised by the amount of interesting information and captivating history involved. These devices are expected to hold up to a large amount of weight and use on a daily basis. It’s important to utilize high-quality elevator parts in your building, delivering a reliable and stylish system to transport your employees and guests quickly and efficiently. Contact our elevator cab company today to see how we can optimize your system!